Crown Princess Adelaide will, one day, inherit the Eagle Scepter of her father, Emperor Frederick Redbeard. But will there be a throne to inherit? For behold: their mighty Empire, and all of the lesser powers of the world, are beset by invaders from the sky, hideous creatures seemingly bent on the destruction of all life. Even the legions of her mighty father seem unable to stop the relentless advance of the creatures which plummet to the surface of the world, riding in smoldering pods, then spill out and immediately attack. Will Princess Adelaide’s forbidden knowledge of wizardry be the salvation of her world? Since she was a child, Adelaide was driven to explore the dark arts. Normally penalized by death, dabbling in the dark arts was forgiven to the next in line to the throne, but not without punishments and disapproval. Through her furtive collection and study of scrolls and magic books, she learned the ways of the wizard, but learned something else too: that a great evil force had long dwelled in the heavens. In olden times, they were held off by a mysterious device located at the top of the world, at the northern pole, some sort of enormous construct. Ignored and allowed to deteriorate, this device eventually weakened and then became inert, and now the great evil was returned, and unleashed upon the world again. What was the device? Could Adelaide find it, and, using any skill – magical or otherwise, restore it so that the invasion from the stars might be stopped? First setting out with a small entourage, she was intercepted and confined, her father furiously berating his only heir from placing her life at risk at a time that he faced death in battle on an almost daily basis. But Adelaide was as willful and single-minded as her father -- soon escaping confinement, she gathered a motley band to accompany her to the Northern Pole, looking for what, and exactly where, she did not know, knowing only that she would find it ….. These 28mm scale figurines are cast in pewter. They are provided unpainted, and need to be assembled -- usually this just means attaching them to the provided plain plastic base by means of a slot and tab system, but some more complicated models may need a bit more assembly. 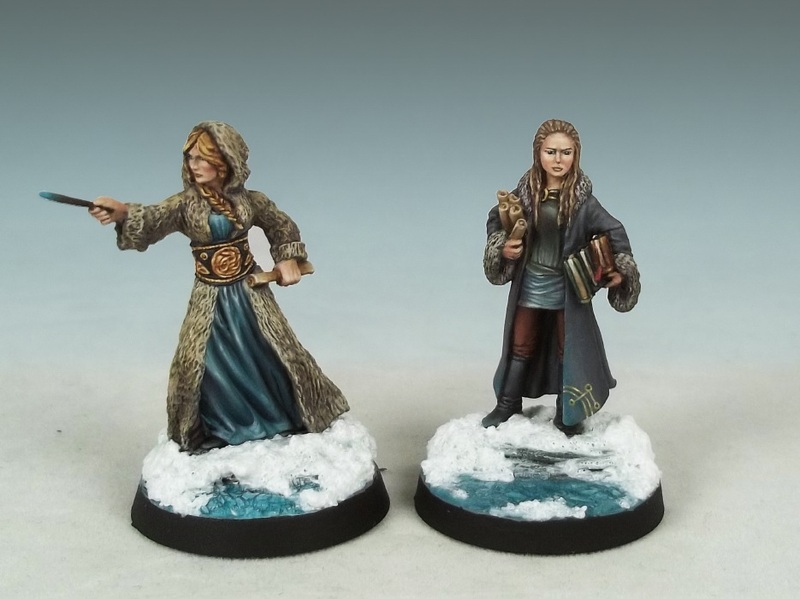 Any decoration on the base shown in the images on this page has been added by the painter and is not part of the figurine or the plain plastic base. Her mother dead in childbirth and her father often absent fighting his wars of conquest, Crown Princess Adelaide was raised by the nuns of the Holy Order, and by her aunt, Adelheid. The sisters of the Holy Order and their narrowminded catechism bored the adventurous girl, but she loved to spend time with her blacksheep aunt, who revealed the existence of supernatural powers, and taught her a few tricks she had learned from a banned book. Adelaide practiced these tricks and improved them, and it soon dawned on her that they were more than sleights of hand. In fact, they represented an entire hidden aspect of existence which she yearned to better understand. As she grew older, Adelaide became obsessed with collecting books of magic and scrolls of power, learning the spells and taking in the knowledge that had been, in older times, such a threat to the stability of civilization that they were banned outright in the Imperium. Meanwhile, to please her father, whose mind dwells constantly on further conquest, Adelaide has not neglected her duties as the Imperium's future warlord, and has spent many hours with her father's high nobility learning strategy and tactics. 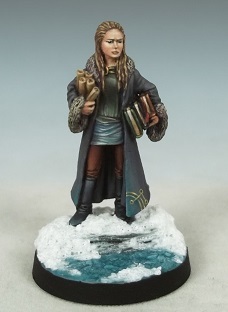 As a result she has also developed the skill and willpower to lead a warband in battle. The slave girl Tyleen is from the Western Kingdom, recently conquered by the Imperium. In the West, magic is more openly practiced, and Tyleen learned her first crude skills in a childhood running the streets of the kingdom's greatest city, from beggar-thief witches. Although her wizardry is not book-taught, this proud and willful girl nonetheless shows raw talent and a desire to learn and refine her art. Taken into slavery when the Western Kingdom was recently defeated and subjugated by the Imperium, she was transported to the Imperial capital. There Tyleen found herself rescued by Alelaide, who disapproves of slavery and stated her claim as Crown Princess to as many of these war captives as she could manage, treating them as much as possible as equals rather than as property. Adelaide immediately sensed Tyleen's latent magical powers and soon began training her in the books of magic. The folk of the Western Kingdom are proud, sometimes to the point of arrogance -- even the peasants and urban poor -- and Adelaide often has a difficult time keeping the surly teenaged girl under control. Nonetheless the unlikely pair have developed a strong bond, and have become inseparable. When Adelaide needs a book or a scroll, she has only to utter a word and Tyleen will have it extended (although often with an accompanying eyeroll). 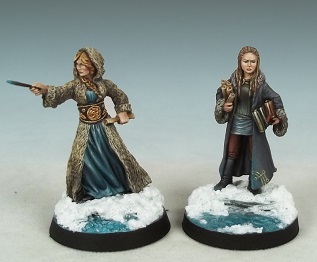 Sets of Polartrek models available at discounted pricing.